Thomas and friends *** BIGGEST World's Strongest Engine Trackmaster competition *** / championship. This is a Thomas and friends motorized train toy competition. This is part of my toy colection of Thomas and friends trackmaster trains and tracks tomy, Hit, fisherprice. Thomas and his friends World's Strongest Engine competition / championship. This is a Thomas and friends ... Strongest Engine Trackmaster ThomasToyTrains. 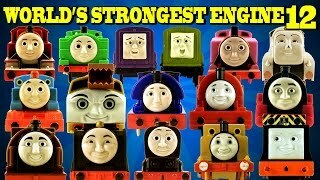 Thomas and Friends 12 * BIGGEST World's Strongest Engine * Trackmaster ThomasToyTrains" World's Strongest Team 1 *** Trackmaster Trains ThomasToyTrains"